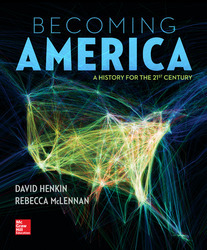 This new edition is powered by Connect History, an easy-to-use learning platform that gives instructors access to engaging assignable and assessable tools, such as primary sources and interactive maps – all of which are tied to learning objectives – that support student success and help bring history to life for students. SmartBook, makes study time as productive and efficient as possible. It identifies and closes knowledge gaps through a continually adapting reading experience that provides personalized learning resources at the precise moment of need. This ensures that every minute spent with SmartBook is returned to the student as the most value-added minute possible. The result? More confidence, better grades, and greater success. Interactive Maps, assignable through Connect and tied to assessment, encourage students’ geographical and historical thinking by demonstrating things like changing boundaries and migration routes, war battles and election results. Primary Sources, Connect History’s Image Bank allows users easy and quick access to hundreds of additional primary sources which can be downloaded and incorporated into lectures or assessment materials. The Primary Source Primer is a brief, illustrated video tutorial on how to read and analyze a primary source. As students watch, they are prompted at various points in order to confirm understanding. Critical Missions, immerse students as active participants in a series of transformative moments in history. As advisors to key historical figures, they read and analyze sources, interpret maps and timelines, and write recommendations for what do to in a historically critical moment. Later, students learn to think like a historian, conducting a retrospective analysis from a contemporary perspective. Interpreting the Sources - The primary sources in these boxed features include public and private documents, visual sources, material artifacts, and transcripts of oral traditions and stories. A headnote puts the source in context, and a series of questions after the source challenges students to think deeply and analytically about its significance. "How Much Is That?" makes monetary figure meaningful by putting them in the context of today’s dollar or other contemporary points of reference. Students will gain a sense of the relative value of sums mentioned in the narrative, from the cost of the Louisiana Purchase to a Union soldier’s wages to the price tag for a 1950s suburban home and hamburger. Singular Lives spotlights unusual women and men whose experience, perspective, or mythological status captures some broader point about the period. These case studies reinforce the notion that individuals as well as larger social forces shape history. States of Emergency dramatizes scenes and moments of destruction, violence, epidemic, and natural disaster, from the Stono Rebellion and the New Madrid Earthquake to the Great Chicago Fire and the New York blackout of 1977. These extraordinary events often had far-reaching social and political consequences for the story we tell in the main narrative, but they also gripped the popular imagination and became the focus of fears and fantasies that help us understand larger historical forces. Hot Commodities offers a detailed study of consumer goods, food, paintings, recordings, and performances that were tellingly popular at a given point in time. These boxes—with topics ranging from beavers and Bibles to cigarettes and garbage—reinforce the importance of material artifacts to the study of the past. The point is that consumption patterns are not new phenomena (though they have changed radically) and that they offer valuable insight into past societies, much as they do in the present day. Spaces and Places features buildings, landscapes, monuments, and virtual spaces as sources for exploring the country’s built and natural environments. U.S. history is partly a story of how human beings have continually reshaped and reimagined the landscapes that we now take for granted. With rich pictorial detail, we show how the spaces and places in which history unfolds have transformed over time.